Daisy chains. 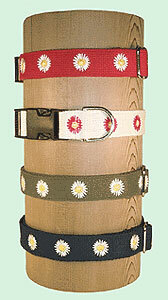 Cheerful cotton webbed collars snap closed with durable plastic fasteners. Blue, olive, red, or natural. Companion lead repeats daisy design on the handle.